Prospect Mountain is one of the most popular hikes in the Lake George Region at roughly 3-miles round trip. Because its steep grade makes it quite difficult in spots, this hike is not recommended for young children. Upon reaching the summit 2,030 feet above sea level, hikers will be rewarded with 100-mile views of Lake George and the Adirondacks. The Prospect Mountain Trail begins on Smith Street in Lake George Village. From Exit 22 of I-87, turn right onto Canada Street, then right onto Montcalm Street (across from Shepard Park). Continue on Montcalm, then turn right on Cooper Street and travel one block until you reach West Street. Turn left onto West Street, go up one block, and turn left onto Smith Street. On Smith Street, you'll see a sign indicating the beginning of the trail, along with the entrance to an elevated walkway. Have you ever seen people walking above the Adirondack Northway just south of Exit 22? This is part of the Prospect Mountain trail! Once you traverse the Northway on the enclosed, elevated bridge, the more typical portion of Prospect Mountain's trail will begin. If you would still like to experience the panoramic views, but are unable to hike to the summit, you can drive to the top on the Veterans Memorial Highway. This 5.5-mile route was built in 1969 and allows everyone to enjoy the scenery from Prospect Mountain. To access the Highway, travel 1/2 mile south of Lake George Village on Route 9. The entrance is on the right directly opposite the Lake George Chamber of Commerce. The Highway is open daily from Memorial Day until late October (weather dependent) and there is a small fee to access the route. 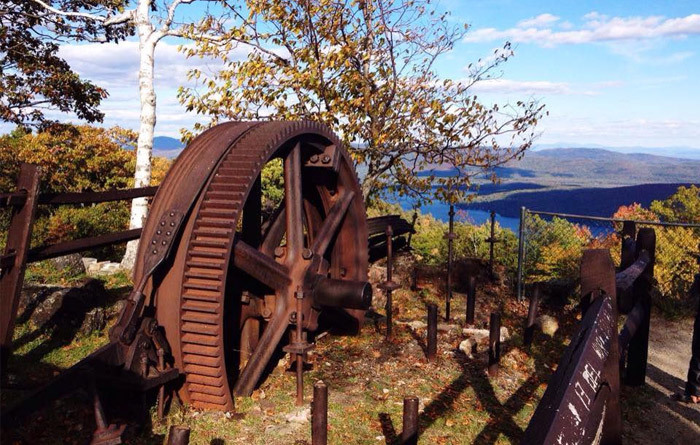 On top of the mountain, visitors will notice remnants of the Prospect Mountain Cable Incline Railway (pictured above), which was at one time the longest cable railroad in the world. It was built in 1895 to transport wealthy visitors to the Prospect Mountain House, a hotel previously only accessible by horse-drawn carriage. The hotel eventually burned down, but its fireplace is still visible today atop the mountain.